Thanks for the great pic! It sure took the guess work away for this Mom. The kids and I were on a nature hike and came upon these berries. We decided to colect them and make muffins but I was a little apprehensive as to whether or not they would be safe. After surfing and finding your site, we will go ahead and bake! Thanks from one “scratched and prickled” Mom! Our 11 year old son took that photo so I’ll let him know it was useful to you. 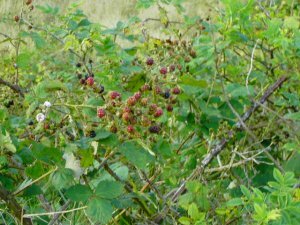 When I was about that age I used to pick and immediately eat wild blackberries around this time of year (wild ones are so tasty). first time for me to know that there are so many wild berries in the world. Very educational.